PRODUCT: #12-14 x 3/4 in. Impax Design, HWH TEK w/ solid cup head & EPDM sealing washer 250/Bag. Price/BAG. Shipping leadtime 4-7 business days. Please specify color # and color before adding to cart; Color Options. Metal roofing or siding to metal. Metal roofing to wood framing. Metal siding to wood framing. Metal panels to wood or metal. Self-tapping hex head DRILL screw for fastening metal-to-metal or Metal-to-Wood. Two-component acrylic polyurethane coating is spray applied to Silver Sentri coated zinc plated fastener head and washer for superior corrosion protection and appearance. Painted with Chromagard high-performance color-coating system based on polyurethane coating systems technology. 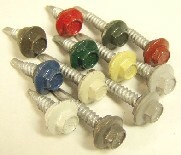 Color match is guaranteed for every color and every fastener. Impax™— Sealer — Drill Screws 12-14 Impax sealer. Integral cupped Hex Washer Head configuration fastener with an EPDM sealing washer instead of the traditional bonded sealing washer. Precision cold forged assuring superior point strength and the fastest drilling time performance through high strength steel and nested purlins. Delivers ultimate performance in light, medium and heavy gage applications. Designed and engineered to have low driving and thread engagement torque and provide maximum clamp load. Painted with VistaCoat high-performance color-coating system based on polyurethane coating systems technology. The two-component acrylic polyurethane coating is spray applied to Silver Sentri coated zinc plated fastener head and washer for superior corrosion protection and appearance. Color match is guaranteed for every color and every fastener. VistaCoat technology is based on construction and automotive finish systems. VistaCoat has superior resistance to installation abrasion for in-place appearance and performance. Hex-head with weatherseal washer.